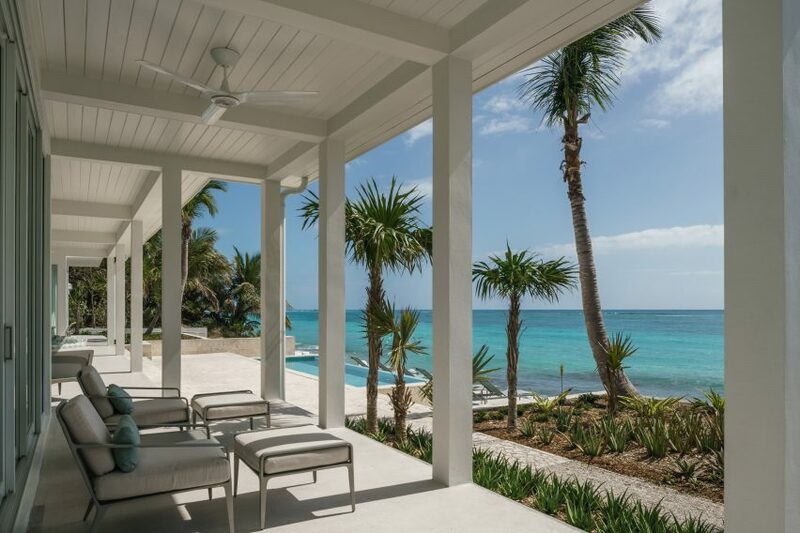 Miami-based Touzet Studio has used touches of blue throughout this house on a tiny Cat Cays island in the Bahamas to match the hues of the ocean that it overlooks. 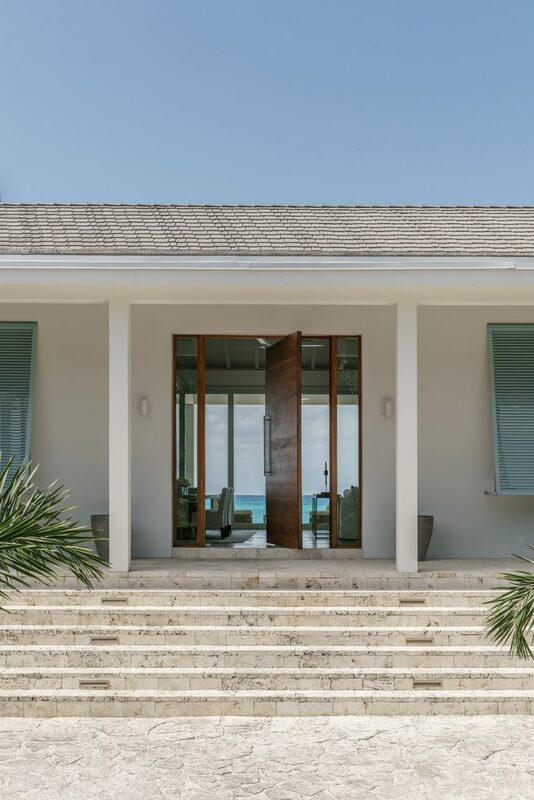 The residence is located on a private beach on the North Cat Cay island that steps down into the Atlantic Ocean at the rear. The project is named Out of the Blue after this view of the water, which provided cues for the simple colour palette inside the residence. 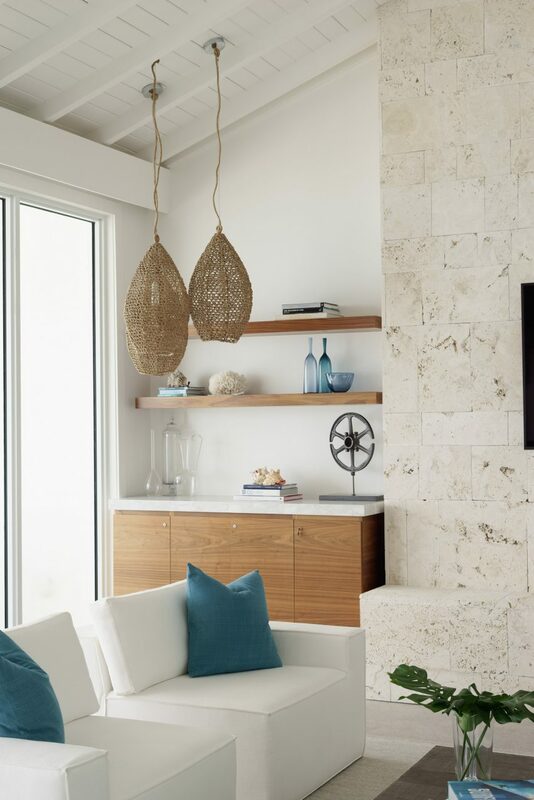 White-painted wood-clad ceilings and walls, and pale stone flooring that resembles sand are offset by blue hints throughout the residence. These include painted shutters, and cushions and plant pots. 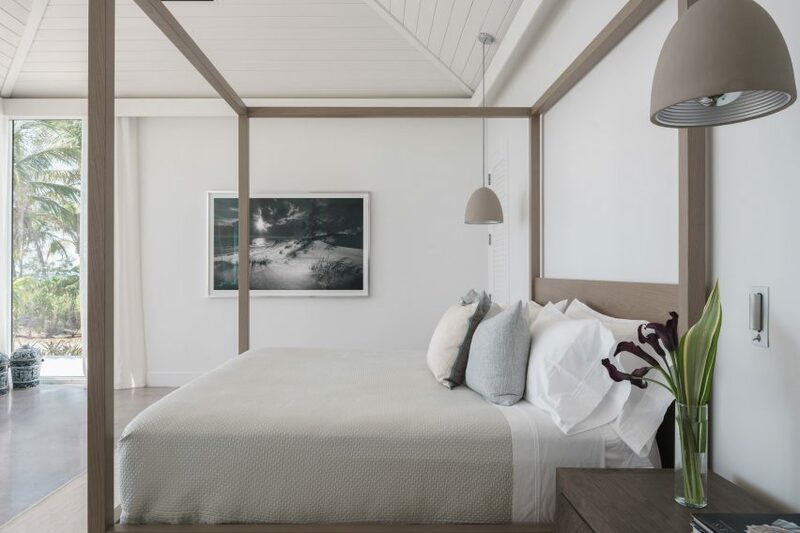 Touzet Studio’s founders, husband and wife Carlos Prio-Touzet and Jacqueline Gonzalez Touzet, built the holiday home as a retreat for their brother- and sister-in-law, who live in Miami. Many of the features are typical of traditional residences found on the island, such as the shutters, native keystone and wood-clad ceilings. But the palette and layout offers a contemporary touch that the team described as a “modern take on island architecture”. 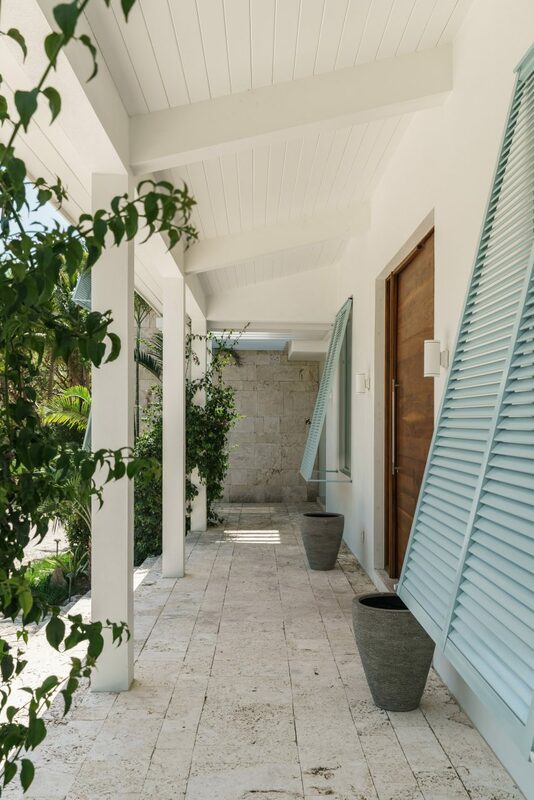 “They asked us to design for them a modern version of a Bahamian house for the tropics, which was not too fussy or overworked so they could truly relax and enjoy,” said the studio in a statement. This aesthetic is most visible in the open-plan living, kitchen and dining room. 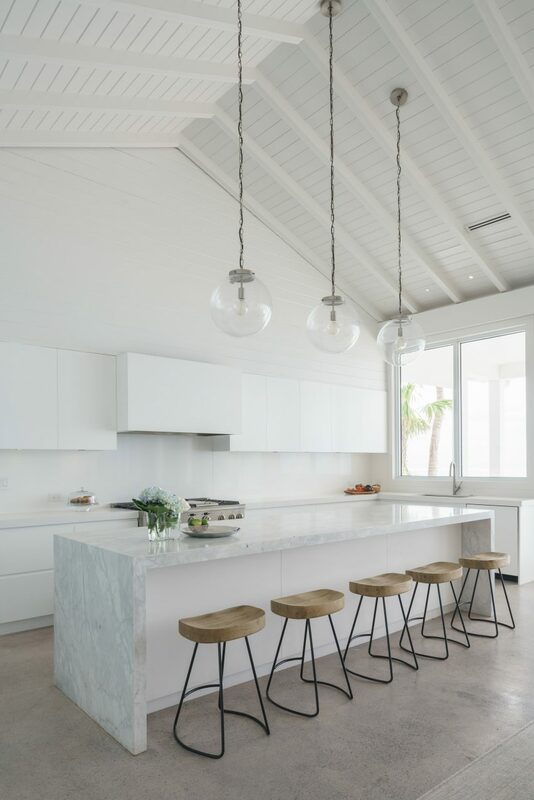 In the kitchen, white cabinetry is placed along the rear wall, and a central island is topped with white marble to form a breakfast bar with wooden stools. Brown, beige and cream hues were chosen for the furnishings in the accompanying dining area and the living room, which features a stone fireplace built on one wall. A set of glass doors that run along the long, rear side of the room open up to a covered patio to create a large entertaining space for the couple, who have two teenage children. From here, a stepped concrete patio leads down to a swimming pool, and a terrace with blue loungers set up to face the beach. Palm trees and other vegetation are planted in between a series of terraces, including a second outdoor lounge set up with a barbecue. 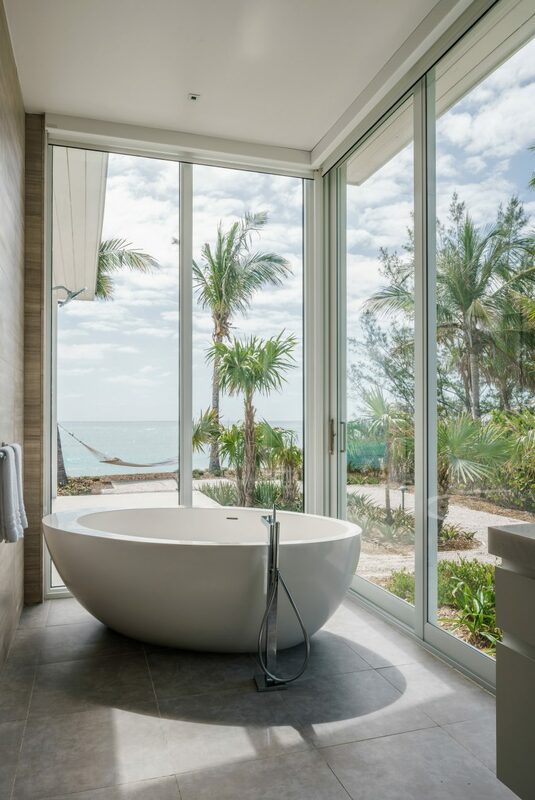 A hammock hangs at another of these outdoor patios overlooked by the glazed bathroom, where the couple can enjoy ocean views while bathing in an oval tub. The bathroom is adjoined by dressing room clad in wood, while dark grey tones are brought into the master bedroom. The rest of the accommodation, including the children’s bedrooms, is placed in the two-storey volume at the other end of the house. The two levels are connected by a staircase with slatted wooden balustrade. Concrete flooring is left exposed on the two levels and the steps. 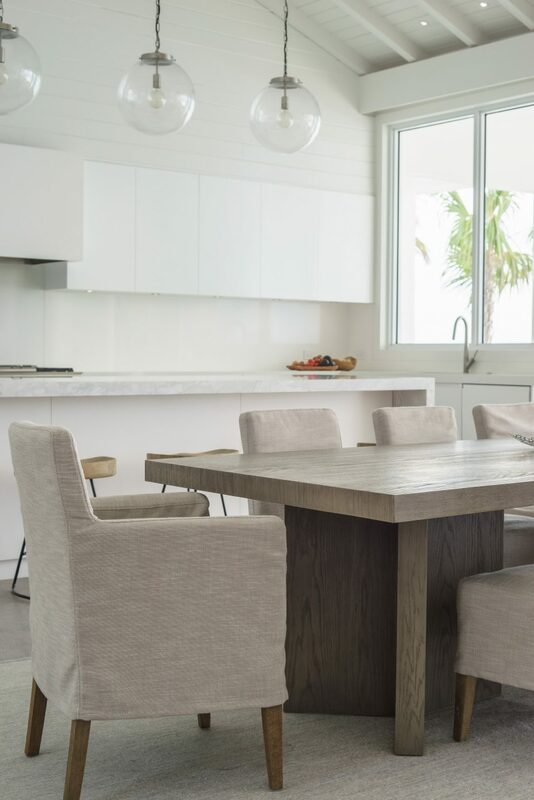 As well as pairing contemporary and modern aesthetically, Touzet Studio has adapted features to make the house better suited to the island’s climate. The team described its strong winds and heavy rainfall as “one of the toughest marine environments”. “We designed this house with both ‘old school’ sustainable principles: big shady porches, overhangs, and volume ceilings that allow the hot air to rise,” said the studio. Rainwater is harvested by gutters on all the roofs and stored in large cisterns, with the grey water recycled and used for irrigation and bathroom facilities. The Cat Cays are formed of the North and South Cat Cay islands. They are among over 700 plus islands that make up the Bahamas archipelago in the Atlantic Ocean – a popular spot for hotels and holiday homes due to its hot weather and access to the sea. 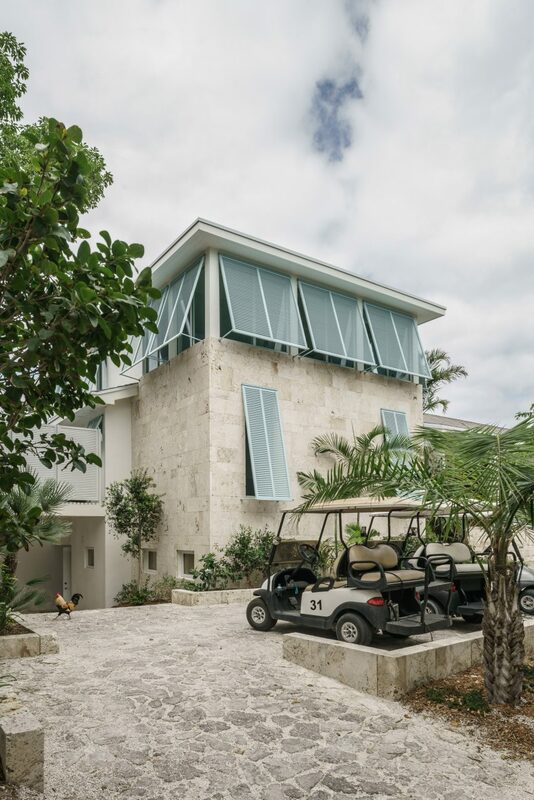 Miami-based architect Chad Oppenheim also built himself a getaway on a secluded three-mile-long island in the Bahamas.